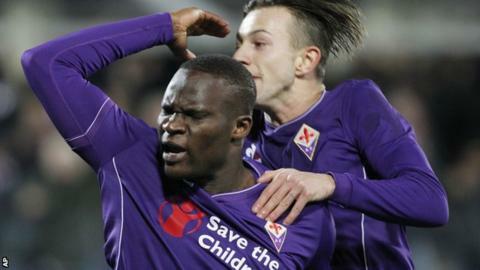 Fiorentina went third in Serie A thanks to Khouma Babacar's injury-time winner against Inter Milan in a match with three late red cards. The Senegalese striker, brought on for the final three minutes, bundled in after keeper Samir Handanovic fumbled. Marcelo Brozovic gave Inter a half-time lead, but Borja Valero made it 1-1. Inter's Alex Telles and Geoffrey Kondogbia were both sent off, with Babacar's winner and a red card for Fiorentina's Mauro Zarate in between. Full-back Telles, booked in the opening minutes, was perhaps unlucky to see a second yellow card with eight minutes left when he was judged to have brought down Federico Bernardeschi. Zarate, whose introduction as a second-half substitute had sparked Fiorentina's comeback, could have little complaint, though, as he was dismissed seconds after the winning goal for grabbing Jeison Murillo around the neck in an off-the-ball incident. Midfielder Kondogbia was sent off after the final whistle for dissent, with television footage showing him applauding referee Paolo Mazzoleni sarcastically. Victory extended Fiorentina's unbeaten Serie A run to five matches as they moved above Roma into the third and final Champions League qualification spot. They dominated the opening 25 minutes - with only a brilliant Telles clearance denying Josip Ilicic an opening goal - but were deflated when Brozovic finished a brilliant Inter counter-attack by firing Rodrigo Palacio's cross high into the net. Valero headed Fiorentina level from Ilicic's deflected cross after an hour, and the home side had the better of the match after that; coming out on top in a crazy finale as Inter suffered a defeat that leaves them in fifth place. Match ends, Fiorentina 2, Inter Milan 1. Geoffrey Kondogbia (Inter Milan) is shown the red card. Second Half ends, Fiorentina 2, Inter Milan 1. Offside, Inter Milan. Marcelo Brozovic tries a through ball, but Jeison Murillo is caught offside. Mauro Zárate (Fiorentina) is shown the red card for violent conduct. Geoffrey Kondogbia (Inter Milan) wins a free kick in the defensive half. Goal! Fiorentina 2, Inter Milan 1. Khouma Babacar (Fiorentina) with an attempt from very close range to the centre of the goal. Attempt saved. Khouma Babacar (Fiorentina) right footed shot from the centre of the box is saved in the centre of the goal. Attempt saved. Mauro Zárate (Fiorentina) right footed shot from the left side of the box is saved in the bottom right corner. Assisted by Marcos Alonso. Offside, Inter Milan. Marcelo Brozovic tries a through ball, but Mauro Icardi is caught offside. Mauro Icardi (Inter Milan) wins a free kick on the left wing. Substitution, Fiorentina. Khouma Babacar replaces Josip Ilicic. Substitution, Fiorentina. Tino Costa replaces Matias Vecino. Corner, Fiorentina. Conceded by Mauro Icardi. Substitution, Inter Milan. Danilo D'Ambrosio replaces Rodrigo Palacio. Second yellow card to Alex Telles (Inter Milan) for a bad foul. Federico Bernardeschi (Fiorentina) wins a free kick on the right wing. Corner, Fiorentina. Conceded by Alex Telles. Rodrigo Palacio (Inter Milan) is shown the yellow card. Delay in match Jeison Murillo (Inter Milan) because of an injury. Offside, Inter Milan. Ivan Perisic tries a through ball, but Mauro Icardi is caught offside. Attempt missed. Ivan Perisic (Inter Milan) right footed shot from outside the box misses to the left following a corner. Corner, Inter Milan. Conceded by Facundo Roncaglia.